I just got back from celebrating the 30th birthday of my daughter, Becky. The extended family had a great time at Kanki, where Becky has wanted her birthday dinners for most of those 30 years. It really is hard to believe that she was born that long ago. It seems just a short while ago when I would carry her on my bent arm with her head cradled in my hand and one leg on either side of my bicep. And, just yesterday when I taught a two-year-old Becky to say dodecahedron. Obviously, as the picture shows, it was a long time ago. 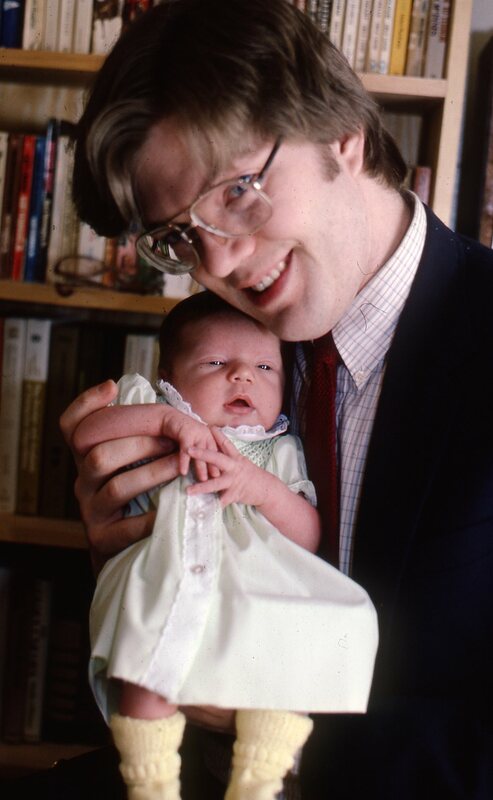 I was 24, considerably younger than she is now. Time does fly. Watching children grow up is both terrifying and rewarding. When they’re little you decide everything for them. To them, you are the world. Both of those things change over time until the day comes when they do what they want and you can only watch. To me, the love they give you when they are adults is even more special because it is a choice. Yes, the love of a baby is unconditional (well, as long as you take care of the basic needs), but it is also uninformed. I think that I was much better able to understand God after I had children. Having raised two-year-olds and teenagers, I am able to catch a glimpse of how God feels when I reject Him—when I act like a two-year-old or a teenager. And, the joy He must feel when I return His love. Happy birthday, Beppers! I’m very proud of the wonderful woman you have grown up to be.